Racing in the front pack, Sam Merriman runs strong in the NCAA Championship meet. A 21st place finish earned the third-year student All-America status. Earning All-America selection in a varsity sport while holding a school record in another. Achieving and maintaining a 4.0 GPA as an engineer at one of the top schools in the country. Sleeping well, eating right and having a social life. For most people, achieving just one of those feats is hard enough. Consistently doing all of them? Simply impossible. 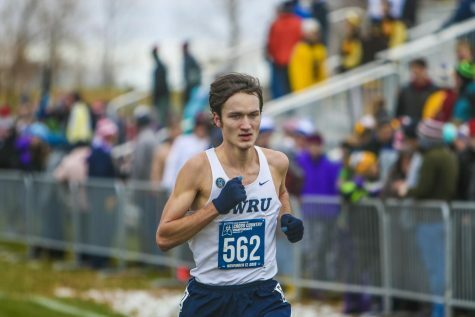 It’s not impossible for third-year student Sam Merriman, the fastest runner on Case Western Reserve University’s cross-country team; it’s his life. After earning the NCAA Elite 90 Award, given to the participant with the highest GPA at each of the NCAA’s championships the night before, he finished 21st in the National Championship race. The top finish earned him All-America status and wrapped up one of the best cross-country seasons in program history. He finished third at the University Athletics Association Championships, won the All-Ohio Division III Championship and finished seventh in the Great Lakes region. 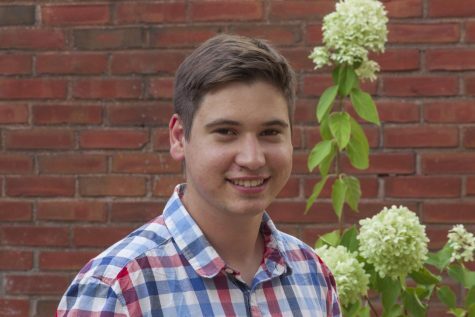 Merriman also has received straight A’s in both of his years at CWRU as an engineering physics major. How does he manage to be successful both on the race course and in the classroom? “Balance is really important,” Merriman said. He also mentioned the importance of finding time to relax and “focus on other stuff” not relating to school or sport. He added that his coaches are “very, very” accomodating to athletes’ academic needs. “They understand that we love doing sports, but ultimately we came here to get a degree,” Merriman said. Though he was “really stressed out” and barely slept before the big race, Merriman ran the fastest time of his collegiate career, crossing the finish line at 24:43.5. He started the race aggressively, trying to keep pace with the top runners, an unusual strategy for the normally well-paced Merriman. At the two-kilometer mark a quarter way into the race, the Spartan runner was in 13th place. The quick start paid off handsomely as Merriman dropped just eight positions for the rest of the race. 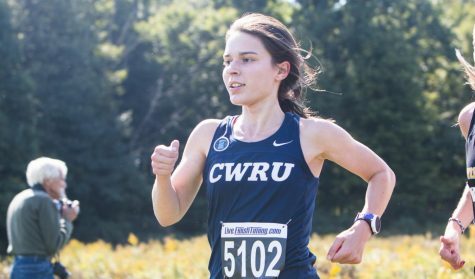 “Coach [Kathy Lanese] and I analyzed last season’s race and found all of the All-Americans were in the top 35 by the mile [split],” said Merriman. So, he planned on going out strong and holding his position. In addition to the bold strategy, Merriman also used his experience to run his “best race of the year.” Last season, he also qualified for the championship meet, but finished quite a bit lower, 167th place to be exact. 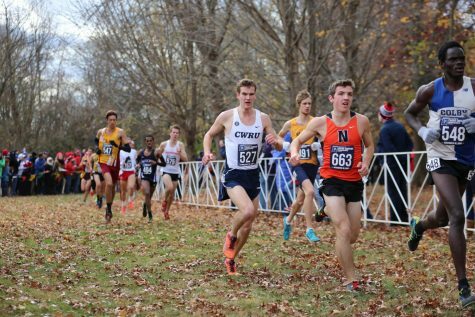 With another year remaining at CWRU, Merriman has one more chance to improve his national standing. And with just six faster runners returning next season, he has a legitimate chance at securing the Spartans a national championship. Improvements are still necessary—he needs to cut off at least 30 seconds—but Merriman knows what he needs to do to hit the mark. “As my former coach said, ‘You’ve earned the right to think about the championship.’ But it’s still a long way off,” said Merriman. As he pointed out, next season is far away. Right now, Merriman is focusing on the track and field season. The distance runner participates in the 3,000 and 5,000-meter runs indoors and the 800, 1,500, 5,000 and 10,000-meter runs outdoors. He holds the CWRU record for the 3,000-meter indoor run with a time of 8:38.05. Whether he’s racing past opponents on the race course or acing physics exams like Neil DeGrasse Tyson, Merriman has succeeding in everything that he’s done so far on campus, and he’s finally being recognized for it.